Mice are about 5 to 7 inches long thats including there tail and weigh about 1/2 ounce. Mice are most active at night and leave a musky odor on there presence. To indicate where mice have been mostly active they leave droppings behind. 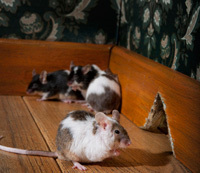 Mice are excellent climbers and can jump up to 12 inches from the floor onto a flat surface. They also can fit thru an opening of 1/4 inches across. They usually come into the houses during cold weather. 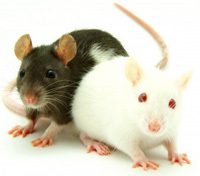 A female can have 5 to 6 mice at a time, which would take only 19 to 21 days after mating. The life span of a mouse is 9 to 12 months. Rats are most common found in chicken houses and garbage dump and are excellent climbers. The rats feed on eggs and baby chickens. Rats can also kil lambs and young pigs. They grow up to 12 to 18 inches and weigh about a pound. They prefer to burrow and nest in the ground and have a musty odor. Each mating average about 8 to 9 individuals but 2/3 of the young don’t survive. Rats can live about 9 months to about a year. Make sure any gap or entry to the house is sealed. Any possible entry to the house you see. Make sure you can sealed it to prevent rats and mice from coming in an out of the house. Traps are generally preferable for small population. Other control methods include anticoagulant rodenticides, single-dose toxicants and chronic rodenticides.